Prayer: God, as you have gathered us this morning, we ask that you also fill us with your Spirit and allow us to feel connected to you and each other by the power of that Spirit. In spirit and truth let us hear, understand and apply your Word into our lives. And now, I ask that you would hide me behind your cross so you are what’s seen and speak through me so you are what’s heard. Amen. Shane Claiborne is a Christian author and thinker, who lives as part of an intentional Christian community in one of the poorest sections of Philadelphia. He too has been thinking about how ‘Interdependence’ is a much more accurate and appropriate thing to celebrate today and every day. He was recently quoted as saying: Independence is overrated and more than that it is a myth. We are all utterly interdependent beings from birth to death. We could not survive without microbes that help build our soil and the plants and trees that create oxygen and offer us food; we would never become mature adults without teachers and mentors; our cities would be full of disease if we didn’t have people who collect our garbage. More than Independence Day we need an Interdependence Day to celebrate our dependence upon one another and the earth, and our ultimate dependence upon God. Write a note of appreciation to a mother; thank her for raising a child. Look through your clothes. Learn about one of the countries where they were manufactured and commit to doing one thing to improve the lives of the people who live and work there. Spend the 4th of July baking cookies or bread. Give your baked goods to the person who delivers your mail or picks up your trash the next time you see them. Spend the day hiking in the woods. Think about how God cares for the sparrows and lilies of the field. Sit down and handwrite a letter to an old friend or family member. Tell them one of your favorite memories of them. Look for everything you have two of and give one away. Attempt to repair something broken. Appreciate the people who repair things for you one a regular basis. Track down old teachers and mentors. Let them know the influence they have played in your life. Visit an elderly neighbor or family member. Have them tell you the story of their life. Pray the Lord’s Prayer and commit to one concrete action to live out each part. In Communion we by coming to receive the Eucharist we are recognizing that we are not able to do this thing called life on our own. We are, of course, not capable of achieving eternity in heaven by ourselves, but communion is about more than just ‘getting to heaven’. It is about just what its name implies – communing with our creator, savior and God. Connecting to the one that is all and created all and on whom (whether we accept it or not) we ultimately depend. Communion is also about remembering just how far Jesus had to go to reconnect us to our God. A true sign of the importance of connection, community and interdependence. Baptism is one family – an independent family unit (self sufficient as it may seem) acknowledging that raising a child requires more than they have by themselves. Choosing to bring a child for baptism – or to make that decision for yourself as an adult – is a recognition that we need God’s help to live this life the way we are intended to live it – and really we need God’s help just to make it through at all. This is how God intends it to be. And this is how Jesus modeled life for us. In his own life, the only time Jesus is ever alone – and the moments certainly seemed fleeting – is to go off to pray. In Christ’s alone time, he focused on the one in whom he was truly dependent on, communing with his God and father to give him strength for the life he was called to lead and the journey which he was to walk. Jesus, as we know, was almost never alone because he chose to surround himself with a close group of friends and students – the disciples. And we see how Jesus valued interdependence and community in our Gospel today, as he paints a picture of freedom and independence – the message translates his words as ‘take nothing but a toothbrush’ – He also sends them out, not alone but in pairs. The disciples are sent with someone to lean on, someone to support and be supported by – in short, someone to be interdependent with. § Jenny @ GA – we care (or at least should) about GA because what happens there, happens to us and for us. But of course it matters more to us – or feels more real to us, feels closer to us – because someone we know and love is there. Jenny is a part of us, she and her family are a part of this family of faith. o Two are better than one, because they have a good return for their work: 10 If one falls down, his friend can help him up. But pity the man who falls and has no one to help him up! 11 Also, if two lie down together, they will keep warm. But how can one keep warm alone? 12 Though one may be overpowered, two can defend themselves. A cord of three strands is not quickly broken. As much as we fight for, protect and love our independence – we were not designed to walk through this life alone. And in fact, a life lived alone, away from connections and community is difficult at best and fairly impossible. – We are the Body of Christ, we are interconnected to each other, and we must begin to act like it. What is interesting, to me at least, is that this isn’t just a Christian thought or phenomenon. There are those in the private, business sector that are beginning to sense the importance and reality of our interdependence. Recently one of these business leaders, Steve McCallion , wrote a ‘Declaration of Interdependence’ – with the rational that as great and important as the original Declaration of Independence is and was, much of it is dedicated to grievances against a King we haven’t recognized as our leader in over 200 years and that although our original declaration has served us well, we need a new one to guide us through the next 100 years. This secular, business leader is essentially saying that when we assert our own ‘freedom’ or ‘independence’ at the cost of our community, connectivity and interdependence we only hurt ourselves – when we focus on ourselves (and our freedom/independence) and miss the connections we have. We fall short of our goal and we have weakened others as well. It is not the striving for freedom or independence that is wrong or detrimental. It is the trying to go for it alone or only get it for ourselves that falls short of our call and purpose in life. When Christ chose to come down from heaven, be born as one of us, live a perfect life with us and finally to die for us we became indelibly connected to the God that created us, and as God created us in God’s own image (that of a God in relationship: Father, Son, Holy Spirit) we are designed to be in community. And this design is for all things: our search for faithfulness is meant to be done within a community; our striving for good stewardship of our gifts, abilities and our time is meant to be done with in a community; raising our children and supporting our families is meant to be done in a community and all aspects of our ‘spiritual growth’ the search for truth, understanding, connection to God and purpose in our lives all of these things are meant to be undertaken and discerned with in a community centered in, focused on and connected to Jesus Christ. As we heard the Word of God from Galatians: ‘I have been crucified in relation to the world, set free from the stifling atmosphere of pleasing others and fitting into the little patterns that they dictate. . . . It is not what you and I do . . . It is what God is doing, and he is creating something totally new, a free life! Right now, therefore, every time we get the chance, let us work for the benefit of all, starting with the people closest to us in the community of faith. At the beginning I shared with you some of Shane Claiborne’s 40 ways to celebrate interdependence. 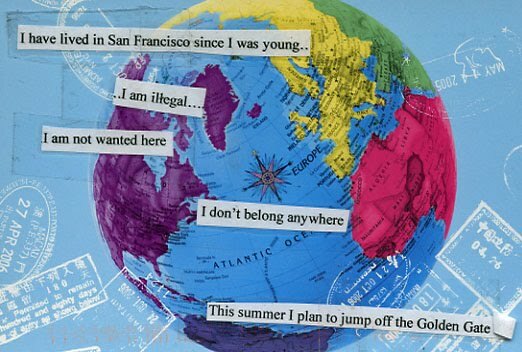 A disturbing post on PostSecret yesterday revealed an illegal immigrant pledging to jump off the Golden Gate Bridge - but 20,000 online voices have responded with hope. PostSecret, a blog that weekly displays anonymously mailed-in secrets on postcards from across the country, has long been known for revealing suicidal secrets, and has set up a phone hotline in response since the blog began in 2004. Yesterday, a postcard read, "I have lived in San Francisco since I was young ... I am illegal ... I am not wanted here. I don't belong anywhere. This summer I plan to jump off the Golden Gate." While there's unfortunately no way to know if the card's writer has seen the overwhelming number of responses on Facebook, one can only hope the community of writers has helped changed at least one person's mind -- perhaps even beyond the person who wrote the card. · Now, I don’t know – I don’t have any idea if the people behind the facebook group and those involved in other efforts to reach out to the writer of that postcard are Christians. But I know that Christ is certainly present in their actions and in the relationships and community they created as they realized their interdependence and sought to care for their neighbor, This – I am sure – is how God designed us, created us to act and interact. I don't know if I could live with myself if I baked something for the garbage folks and they threw it away. That might leave devastating scars. Quality sermon, but it's a bear to read the way it's formatted. I love the commitment to blog the sermons. I think it will be a cool way to keep up with things.